A common issue for laptop users is the lack of GPU power. Even the fastest mobile GPUs, in SLI or Crossfire cannot reach the echelons of performance of a higher-end desktop, mainly due to the power consumption and heat generation. Not only that, laptops with high-end mobile GPUs in order to cope with heat generation tend to be far from portable. Sure, they are still easy to carry around compared to a full-size desktop system, but not many are willing to carry one around on a daily basis. In other words, if you want a laptop that's relatively portable, you are left with mediocre GPU performance that usually doesn't satisfy the needs if you happen to be an active gamer. Ever since the original Thunderbolt was released back in 2011, there has been a lot of discussion about the potential of using Thunderbolt for external GPUs. Today's mobile CPUs are far more than capable of driving desktop GPUs and as Thunderbolt is essentially just PCIe and DisplayPort in a single interface, a laptop with an external GPUs makes almost too much sense. So far a handful of companies, such as MSI and SilverStone, have showcased their external Thunderbolt GPU enclosures at trade shows, but due to issues such as performance and hot-plug applications, no-one has made it to retail . Intel's decision to double the bandwidth with Thunderbolt 2 negated the launch of the original Thunderbolt-based designs, although with any luck TB2 should be an appropriate drop-in. Especially with GPUs, bandwidth can make a dramatic difference in performance and given the niche of external Thunderbolt GPUs, many users wouldn't have been satisfied with a product that doesn't provide at least near the maximum performance. Another big issue is obviously driver and operating system support. To make matters worse, nearly all Thunderbolt-equipped devices are Macs and traditionally Apple likes to have very tight control over drivers and other elements of the OS, making it hard (or even impossible) to develop an external GPU that would also function under OS X. In the PC arena, a few motherboards and products exhibit Thunderbolt support, and it is primarily up to Intel working with Microsoft to develop Windows based drivers. Disclaimer: All information and results here are based on a forum post and a (now private) Youtube video. We cannot guarantee that the results are accurate, thus any and all purchase decisions must be done at own risk with the possibility that the results may or may not be on par with what is reported below. As no company has set forth and commercialized their products yet, the enthusiast group has been looking for a do-it-yourself method to drive an external GPU over Thunderbolt. I came by a very interesting setup over at Tech Inferno forums today and thought I would share it with a larger readership here. 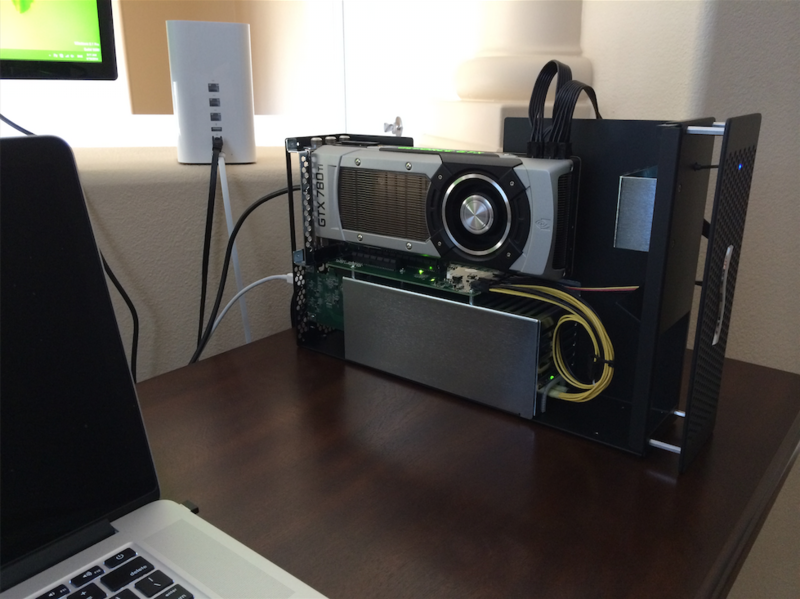 A forum member squinks has managed to run an NVIDIA GTX 780 Ti over Thunderbolt 2 using Sonnet's Echo Express III-D chassis with Corsair's RM450 power supply dedicated to the GPU. Update: The video of the setup in action originally went private right before our post but it has now been made public again and can be seen here. The results are certainly auspicious. Based on squinks' own tests and GTX 780 Ti reviews posted online, the performance seems to be around 80-90% of the full desktop performance based on synthetic benchmarks (3DMark and Unigine Heaven). Given that Thunderbolt 2 offers only 20Gbit/s of bandwidth while a PCIe 3.0 x16 slot offers 128Gbit/s, getting 80-90% of the performance is a lot more than expected. This will vary depending on the game, as based on our own PCIe scaling tests the PCIe bandwidth may cause little to no difference in some games while in others the drop can be close to 50%. The more severe the needs of the PCIe connection, the worse the performance. Either way, Thunderbolt 2 can show a potential for external GPUs even when talking about the most powerful ones that should also require the most bandwidth. According to the forum posts, the setup is also pretty much plug and play, but only as long as the GPU is connected to an external monitor. 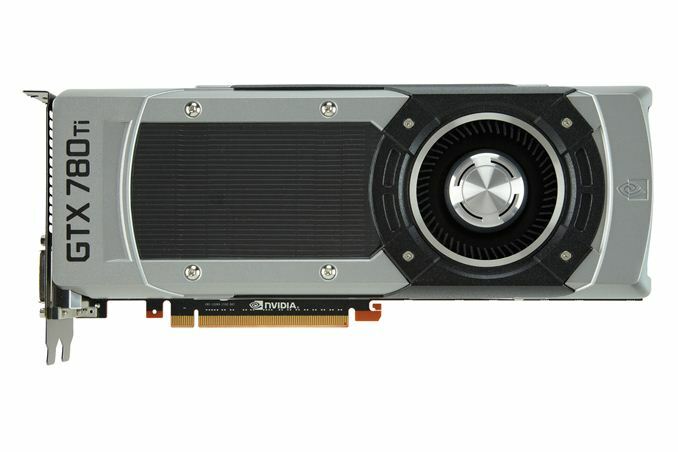 Once everything has been connected and drivers installed, the GTX 780 Ti will be recognized as a GPU like it would in any desktop system. Getting the external GPU to drive the internal display is also possible, although there apparently seems to be some limitations with this homebrew method. First off, it only works if the computer doesn't have a discrete GPU as then NVIDIA Optimus can be used to enable GPU switching. If there is already a discrete GPU in place (like the GT 750M in the high-end 2013 rMBP), then Optimus cannot be used and unfortunately you'll be limited to an external monitor. Secondly, there seems to be some loss in performance (~5-20% in addition to the original loss from Thunderbolt 2) when driving the internal display, which is likely due to Optimus and its limitations. The big question is whether such setup reasonably affordable in any way. Currently, the short answer is no. The Sonnet Echo Express III-D chassis alone costs $979, and you'll need to add the cost of the GPU and power supply to that. 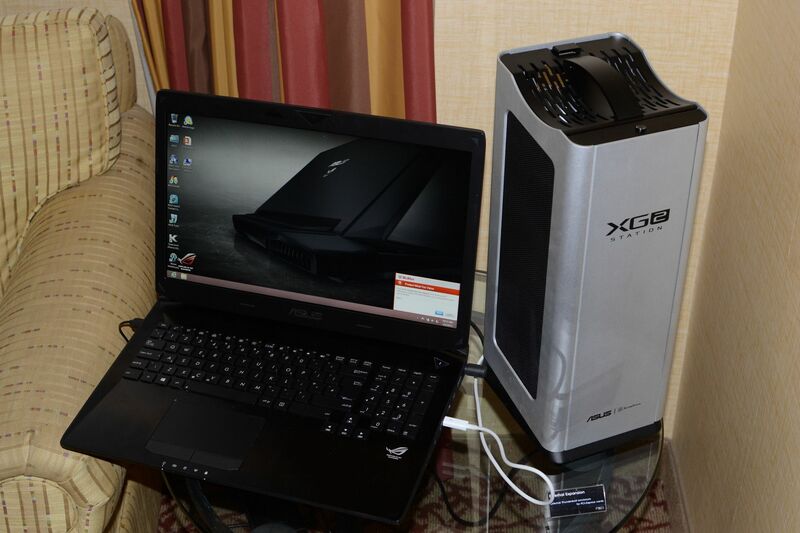 The weight of the chassis is also 7.5lb (3.4kg), without the GPU or the power supply, hardly making it all that portable. In total this means ~$1500 minimum if you are going with a higher-end GPU (which you should given the cost of the chassis). For comparison's sake, I quickly gathered parts for a decent gaming rig in NewEgg and the total came in at $764.94 (without GPU and PSU). That's with a Core i7-4770K, ASUS Z87 motherboard, 8GB of DDR3-1600, 120GB SSD, 1TB hard drive and mid-price case, so we are not even dealing with a budget system. In other words, you can build a higher performance system for over $200 less and take full advantage of your GPU. Update 2: As some of you mentioned in the comments, there are cheaper alternatives available that provide about 70-90% of the desktop performance. What you need is a Thunderbolt to ExpressCard adapter (like Sonnet's Echo ExpressCard Pro) and an ExpressCard to PCIe adapter (like the BPlus PE4L V2.1), which together come in at $240 when bought straight from the manufacturers' online stores. Add a cheap ~400W power supply to that and the total is less than $300 (without the GPU, of course). If you are interested in external Thunderbolt GPUs, I recommend that you take a good look at Tech Inferno forums as they have several guides and other resources from troubleshooting to benchmarks. All in all, it is fun to see an external GPU connected via Thunderbolt 2 can actually get up and running. The price and DIY-ness are currently factors that don't exactly allure the masses, but there is a potential market for a retail product that is designed specifically for this. Pricing is, of course, a major factor and at $200-$300 I could see external GPUs gaining popularity but once you go over $500 it, in most cases, becomes more viable to build a dedicated gaming rig. so use 2 USB 3.0 lanes? That should be enough bandwidth to get GPU performance that's superior to a GTX860M at least. At the sizes and estimated price of some of these external GPU enclosures, an mITX system based around a silverstone RVZ01 offers quite a bit of competition.